A medium size (12 inches high by 21 inches wide) cultivar from Eldren and Nancy Minks of Minnesota, this seedling selection of unidentified parentage was registered on their behalf by Kevin Walek (Hosta Registrar) in 2009. 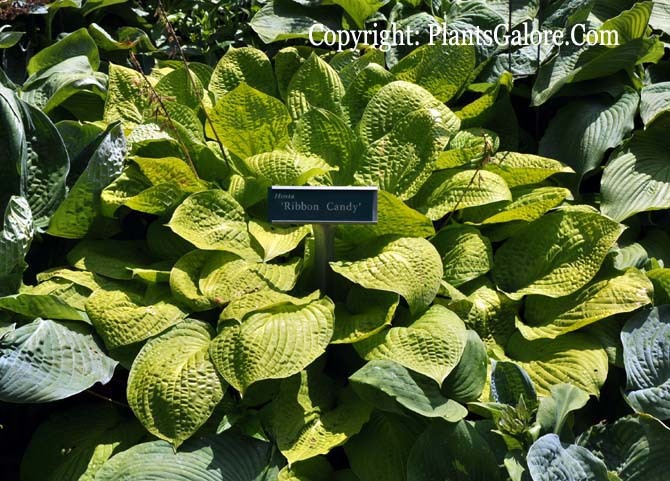 It is an inconsistently variegated hosta with chartreuse colored foliage that has a creamy white streaked variegation. The leaves may turn to a whitish color later in the season. According to The Hostapedia by Mark Zilis (2009), "I've seen this cultivar in three different collections...the variegation was very irregular and the plants were very small...Van Wade of Wade and Gatton Nursery of Ohio described 'Ribbon Candy' as having "Small green and yellow variegated leaves" and being "very rare"."